The National Institute of Neurological Disorders and Stroke (NINDS), a part of the National Institute of Health (NIH), defines Bell's palsy as "a form of facial paralysis resulting from damage to the seventh (facial) cranial nerve." This condition is considered to be normally a transient phenomenon and not permanently disabling. It is named for Sir Charles Bell, a Scottish surgeon who, over two hundred years ago, did much of the earliest research regarding the anatomy and pathology of the cranial nerves. There are 12 sets of bilateral cranial nerves originating in the posterior portion of the brain stem, called the pons. These nerves control various functions in the upper portion of the body, especially within the face and head. The seventh cranial nerve enters the facial region through a small opening in the bony area behind the ear called the stylomastoid foramen. From the stylomastoid foramen, the nerve enters the parotid gland and divides into an estimated 7,000 nerve fibers that control a wide range of facial and neck activity. Seventh cranial nerve endings control neck, eyelid, and forehead muscles; are responsible for facial expression, the secretion of saliva, the volume at which sound is perceived; and a myriad of other functions. The taste sensations for the front two-thirds of the tongue are sent to the brain via the seventh cranial nerve. In Bell's palsy, this nerve becomes compressed due to swelling and inflammation that is a part of the body's reaction to an infectious disease process. This compression results in weakness or paralysis that normally occurs on one side of the face only. However, though highly unusual (occurring in only 1 percent of all incidences), it is also possible to have bilateral Bell's palsy, that is, paralysis on both sides of the face at the same time, caused by compression of both seventh cranial nerves. Bell's palsy, in itself, is not contagious. Many of the agents that cause it, however, are conditions that have already caused an infection in the body. In the past, Bell's palsy was thought to be a highly uncommon occurrence. It is now known that this nerve disorder is the most common cause of one-sided facial weakness for children. It affects on average approximately one in every five thousand people worldwide, and nearly 40,000 Americans each year. Because diseases that compromise the immune system such as HIV infection or sarcoidosis can also result in Bell's palsy, there are geographical variations in the incidence of the disease. Bell's palsy is seen more commonly in areas where AIDS or sarcoidosis are more prevalent, but its incidence overall throughout the world remains constant. The majority of Bell's palsy sufferers are adults. This disorder is much more likely to occur in old age or in the last trimester of pregnancy than in childhood. Diabetics are four times more apt to contract Bell's palsy than non-diabetics. Though children are considered far less likely than adults to contract Bell's palsy, they are not immune from it. There is no difference in the incidence of Bell's palsy between males and females, nor does race seem to be a factor. In addition to incidence, severity of symptoms and recovery rates appear to be equal across both gender and racial lines. The number of children that contract left-sided Bell's palsy is no different from the number that get the right-sided form. As noted previously, Bell's palsy occurs as a manifestation of the body's reaction to microbial infection of the structures surrounding the seventh cranial nerve. The most commonly responsible germs are viruses that are members of the herpes family. The herpes family of viruses share some common characteristics, including the capacity for long life, going into a dormant phase that in some cases can literally last decades following infection, having an affinity for nerve tissue. Herpes viruses are the cause of infections as diverse as sexually transmitted diseases , chickenpox and cold sores. As early as 1970, a study by researcher Shingo Murakami identified HSV-1 as the primary cause of Bell's palsy. Several subsequent studies have consistently verified Murakami's research. HSV-1, also known as herpes simplex and the usual cause of cold sores, has been shown to be the infecting agent in at least 60–70 percent of all Bell's palsy cases. HSV-1 is a herpes virus that nearly all of the human race has been exposed to, with exposure beginning in early childhood. It is spread through kissing, sharing towels, and/or sharing eating and drinking utensils. It is now known that HSV-1 often infects children but does not always manifest itself by the creation of cold sores. (In fact, only 15 percent of people exposed to HSV-1 develop cold sores.) Because the virus becomes dormant following its initial infection of the body, a large number of HSV-1 carriers are thus produced, most often without the infected person or others even being aware that HSV-1 is present. Other herpes viruses such as Epstein-Barr, responsible for mononucleosis as well as the viruses causing the common cold , influenza (the flu) are all potential culprits for causing this condition. The bacterial infection involved in Lyme disease has also been demonstrated as causing some cases of Bell's palsy. The same causative agents infect both adults and children. It is also worth noting that in 2004, the World Health Organization (WHO) Global Advisory Committee on Vaccine Safety reported that in October of 2000 an increased incidence of Bell's palsy in Switzerland was observed following the initiation of an internasal flu vaccine . Due to this adverse effect, the vaccine manufacturer discontinued research and production. In 2003, another internasal flu vaccine was licensed in the United States, and this vaccine has so far shown no increased occurrence of Bell's palsy. However, the Global Advisory Committee on Vaccine Safety continues to monitor these vaccines, and the use of internasal vaccines should be discussed with the family healthcare provider. Clearly the overwhelming majority of children that contract mononucleosis, cold sores, Lyme disease, cold or flu do not develop Bell's palsy. But for some, a reaction of their immune system to viral, or in some cases bacterial, infection causes the production of antibodies which in turn produces inflammation and swelling. In Bell's palsy, this process typically occurs after the seventh cranial nerve's passage through the stylomastoid foramen into a tiny bony tube called the fallopian canal. If the inflammation within the fallopian canal is severe enough, it will exert sufficient pressure on the seventh cranial nerve to make it impossible for the nerve to carry messages to and from the brain. As noted previously, such messages normally carried by healthy seventh cranial nerves control the actions of several facial muscles, each side acting in synchronization to "tell" eyelids to close, tears to form, saliva to be created within the mouth, or the mouth to turn up in a smile.When the nerve is unable to transmit the message to facial muscles to relax or contract, facial muscles quickly become paralyzed or weakened. Such paralysis normally lasts only for the period of time that the nerve is unable to transmit messages. Because this swelling and infection usually affects only the seventh cranial nerve on one side of the head, the resultant paralysis normally occurs solely on one side of the face and affects only the facial areas that the seventh cranial nerve transmits to. Though not always present, the child may complain of headache or pain behind or in front of the ear a few days prior to the onset of Bell's palsy. An over-all droopy appearance of the child's facial expression. Swelling of the child's face. The child has a continually runny or stuffy nose. The child has either excessive or reduced production of saliva. The child is having difficulty speaking. The child is unable to blink or completely close one eye. Drooping of one side of the child's mouth is noted. There are problems with the child holding food or fluids in the affected side of the mouth, resulting in drooling or difficulty swallowing. The child complains of either diminished, distorted or complete inability to taste food or drink. The child is experiencing Hyperacusis , or hearing sounds as seeming louder than they really are. The child is experiencing photosensitivity, or sensitivity to light. The child complains of dizziness. Signs and symptoms of Bell's palsy typically manifest themselves within 14 days after a child has had a viral or bacterial infection. There is usually a very rapid onset once facial paralysis or weakness makes an appearance, and Bell's palsy normally reaches its peak symptoms within 48 hours of onset. In some rare cases, symptoms may take longer than this, but have very seldom been shown to take longer than two weeks to develop. It is of tremendous importance to clarify the diagnosis, and assure that it is truly Bell's palsy that a child is suffering from as soon as possible. This is because there are several other, far more serious and even life-threatening possible causes for facial paralysis in children. These conditions are considerably more dangerous to a child or teen than Bell's palsy and will require immediate, possibly emergency treatment as quickly as feasible. It is important to remember that paralysis in any other part of the body than the face is definitely not Bell's palsy and should be evaluated by a medical professional as soon as possible. As the facial paralysis of Bell's palsy is usually perceived correctly by parents to be a neurological condition, neurologists are often consulted. However, pediatricians and otolaryngologists (ENT—ear, nose and throat specialists) also treat Bell's palsy. Reaching a diagnosis of Bell's palsy is a process of ruling out other possible causes for the child's complaints and the observed symptoms. As noted previously, other, more serious possible causes of facial paralysis need to be eliminated before diagnosis can be made. Paralysis located in any other part of the body than the face definitely rules out Bell's palsy, and should be considered a more serious potential problem. A detailed history, including queries about recent injuries or falls; as well as various imaging tests such as magnetic resonance imaging (MRI), computed tomography (CT) scans, x rays , and electromyography (EMG) assure that the correct diagnosis is made. Another differential cause of facial paralysis similar to Bell's palsy is Ramsey-Hunt Syndrome. Ramsey-Hunt's chief differences from Bell's palsy are both its causative agent and the severity of some symptoms. It has been conclusively proven that another herpes virus—varicella zoster virus (VZV), the cause of both chickenpox and shingles—is the culprit for Ramsey-Hunt syndrome. This syndrome is usually an adult disease whose incidence increases after the age of 50. However, children and young adults found to have Ramsey-Hunt syndrome are considered at risk for, and in need of evaluation for, having autoimmune diseases. Though most nerve compression in Bell's palsy is mild and temporary for children, the primary goal is to assure that no further damage to the seventh cranial nerve occurs. Careful monitoring is necessary, and in some cases aggressive treatment may include eliminating the swelling and inflammation that is compressing the nerve as quickly as possible. Typically the ideal time for reducing this inflammation is within the first seven days after diagnosis. A 2001 NINDS study showed steroids such as prednisone and the antiviral medication acyclovir offer some relief of these symptoms, but are considered a more controversial treatment by some health care professionals when prescribed for children. Mild analgesics such as acetaminophen (Tylenol) may be ordered if there is pain. Because of changes in saliva production and difficulty swallowing, extra care in oral hygiene for the child may be necessary. As in any infection or injury, rest and good nutrition is of paramount importance in allowing the body to heal itself. Monitoring the state of, and providing care to the affected eye is very important. Tears may not be produced at all, or if produced, run out without actually lubricating the eye. This can cause a stinging or burning sensation in the child's eye due to dryness. Under normal circumstances, we protect our eyes by blinking every five to seven seconds. This provides moisture by moving tears across the eye and stops the entrance of debris from the external world. When the eye is unable to produce tears or close completely or to blink, as often occurs in Bell's palsy, there is danger of doing permanent damage to the cornea of the eye. Children with Bell's palsy who are old enough to follow instructions and are showing eye symptoms should be taught to manually "blink" the eye by holding the lid shut every few minutes with one finger, especially when the eye feels dry. Artificial tear products may be ordered by the pediatrician or specialist. Tinted eyeglasses or sunglasses may be helpful. A patch and eye ointment can be necessary at night if the child is unable to close an eye. If the eye is seriously affected, an ophthalmologist should be consulted to develop the best means of protection for the eye. Though most cases of Bell's palsy resolve uneventfully in children, some do not. It is possible that rehabilitation, including retraining the brain through facial exercises , or even surgical correction for weakened facial muscles can be necessary in extreme cases. In the early stage of Bell's palsy, when facial muscles are the most flaccid, it is desirable to allow the muscles to simply rest and recover on their own. Gentle massage and moist warmth may provide pain relief and improve circulation, but stronger interventions should wait. Usually facial exercises will not be necessary for children with Bell's palsy unless the paralysis does not resolve itself and there is long-term damage to nerves. However facial exercises such as wrinkling the forehead, flaring and sniffling the nostrils, curling and puckering the lips, and several others may be used to retrain the brain's messages to facial muscles. Even younger children can often be taught to do these exercises, and they can be presented by parents or therapists as playing a game—making faces in the mirror. Sessions of facial exercise should be brief and performed two to three times a day. A surgical procedure involving decompression of the facial nerve through extremely delicate microsurgery has, in severe cases, also been done. But its effectiveness in Bell's palsy remains at issue among child health-care providers. Benefits of this surgery are considered by some child health specialists to be insufficient compared to the risks involved. Because compromise of the immune system is so often a facet of children contracting Bell's palsy, good nutrition is necessary to rebuild and strengthen that immune system. This involves following the American Dietetic Association (ADA) nutritional guidelines for children, and possibly the addition of a multivitamin if the pediatrician feels it is advisable. Semi-solid foods such as yogurt, jello, pudding, or ice cream may be easier to take in than liquids if the child is experiencing swallowing difficulty. Grain group: Six servings per day. Includes, per serving, one slice of bread, one-half cup cooked rice or pasta, one-half cup cooked cereal or 1 oz (28 g) of ready-to-eat cereal. Vegetable group: Three servings per day. Includes, per serving, one-half cup of chopped raw or cooked vegetables, one cup of raw, leafy vegetables. Fruit group: Two servings per day. Includes, per serving, one piece of fruit or melon wedge, three-quarters cup of fruit juice, one-half cup of canned fruit, onequarter cup of dried fruit. Milk group: Two servings per day. Includes, per serving, one cup of milk or yogurt, or 2 oz (57 g) of cheese. Meat group: Two servings per day. Includes, per serving, 2–3 oz (57–85 g) of cooked lean meat, poultry or fish, one-half cup of cooked dry beans, one egg, or two tablespoons of peanut butter. Fats and sweets group: Should be limited as much as possible. The potential outcome from Bell's palsy is quite hopeful. NINDS notes that the majority of all Bell's palsy sufferers improve dramatically, with or without treatment, within two weeks. The Bell's Palsy Information Site notes that half of all people contracting this condition recover completely within "a short time," and another 35 percent have "good recoveries within a year." The outlook for children is better. Eighty-five percent of children with this disease recover completely. Ten percent of the children who contract Bell's palsy will have mild weakness remaining afterward, and 5 percent will have severe residual facial weakness. Statistically, 7 percent of all children that develop Bell's palsy will have a recurrent episode in the future. 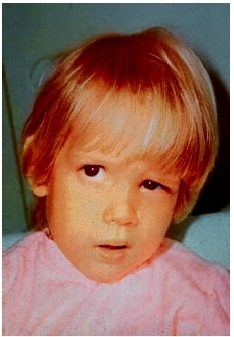 Because of the prevalence of HSV-1, the primary cause of Bell's palsy, it is extremely difficult to prevent children from coming in contact with it. Teaching children to routinely wash their hands, and to not share towels, face-cloths, cups, or silverware can be helpful. However none of these will probably stop a visiting relative or friend from kissing a child or teen, passing along the HSV-1 virus that this friend or relative may carry. Assuring that children get sufficient rest and do not become fatigued can help in maintaining and building up an immune system that can fight off these infecting agents. This strengthening or maintenance of the immune system is even more important following any childhood illness. Autoimmune disorder —One of a group of disorders, like rheumatoid arthritis and systemic lupus erythematosus, in which the immune system is overactive and has lost the ability to distinguish between self and non-self. The body's immune cells turn on the body, attacking various tissues and organs. Cornea —The clear, dome-shaped outer covering of the eye that lies in front of the iris and pupil. The cornea lets light into the eye. Dormant —The biological state of being relatively inactive or in a resting state in which certain processes are slowed down or suspended. Electrooculography (EOG) —A diagnostic test that records the electrical activity of the muscles that control eye movement. Herpesvirus —A family of viruses including herpes simplex types 1 and 2, and herpes zoster (also called varicella zoster). Herpes viruses cause several infections, all characterized by blisters and ulcers, including chickenpox, shingles, genital herpes, and cold sores or fever blisters. Human immunodeficiency virus (HIV) —A transmissible retrovirus that causes AIDS in humans. Two forms of HIV are now recognized: HIV-1, which causes most cases of AIDS in Europe, North and South America, and most parts of Africa; and HIV-2, which is chiefly found in West African patients. HIV-2, discovered in 1986, appears to be less virulent than HIV-1 and may also have a longer latency period. Lyme disease —An acute, recurrent, inflammatory disease involving one or a few joints, and transmitted by the bite of ticks carrying the spiral-shaped bacterium Borrelia burgdorferi . The condition was originally described in the community of Lyme, Connecticut, but has also been reported in other parts of the United States and other countries. Knees and other large joints are most commonly involved with local inflammation and swelling. Mastoiditis —An inflammation of the bone behind the ear (the mastoid bone) caused by an infection spreading from the middle ear to the cavity in the mastoid bone. Mononucleosis —An infection, caused by the Epstein-Barr virus, that causes swelling of lymph nodes, spleen, and liver, usually accompanied by extremely sore throat, fever, headache, and intense long-lasting fatigue. Also called infectious mononucleosis. Neurological disorders —Pathological conditions relating to the brain and/or nervous system. Neuromas —Usually benign tumors affecting nerve tissue. Otitis media —Inflammation or infection of the middle ear space behind the eardrum. It commonly occurs in early childhood and is characterized by ear pain, fever, and hearing problems. Sarcoidosis —A chronic disease that causes the formation of granulomas, masses resembling small tumors composed of clumps of immune cells, in any organ or tissue. Common sites include the lungs, spleen, liver, mucous membranes, skin, and lymph nodes. Shingles —An disease caused by an infection with the Herpes zoster virus, the same virus that causes chickenpox. Symptoms of shingles include pain and blisters along one nerve, usually on the face, chest, stomach, or back. Temporal bones —The compound bones that form the left and right sides of the skull and contain various cavities associated with the ear. Boy's facial paralysis caused by a tick-borne meningoradicultis. extensive information regarding all aspects of this disease, including measures that parents can take, and even products that can be helpful in making the child more comfortable. Bell, Susan Givens, Joan Calandra, and Linda Sowden. Mosby's Pediatric Nursing Reference, 5th ed. Elsevier Science, 2003. Markel, Howard, MD. Practical Pediatrician. New York: H. Freeman & Co., 1996. Taubman, Bruce, MD. Your Child's Symptoms: A Parent's Guide to Understanding Pediatric Medicine. New York: Simon & Schuster, 1992. Bell's Palsy Information. Available online at: http://www.bellspalsy.ws . Bell's Palsy. Available online at http://www.kidshealth.org . National Institute of Neurological Disorders and Stroke. Bell's Palsy Information Page. Available online at http://www.ninds.nih.gov/health_and_medical/disorders/bells_doc.htm . I just wanted to reach out to Adam about your daughter. I came down with Bells on Nov 2nd and my eye will not close. I am trying to find answers as well and am very nervous. I hear children have a good recovery rate. Be well.